Wyden of Oregon and Cantwell of Washington, both Democrats, join in unusual event with patients and patient advocates to raise questions about how President Trump's pick for the U.S. Supreme Court would affect the future of the 2010 health-care overhaul. U.S. Sens. Ron Wyden and Maria Cantwell appeared together Friday to promote Democrats' argument that Brett Kavanaugh on the Supreme Court could boost the cost of insurance for millions of people based on their health status. Their joint appearance at the South Waterfront campus of Oregon Health & Science University was unusual. Wyden represents Oregon; Cantwell, Washington. But Democrats nationally are focused on how Kavanaugh could tip the balance on the high court against the Affordable Care Act, the 2010 law that bars insurers from charging more — or even denying coverage — to people with pre-existing conditions. Asthma, cancer, heart disease and stroke are among them. 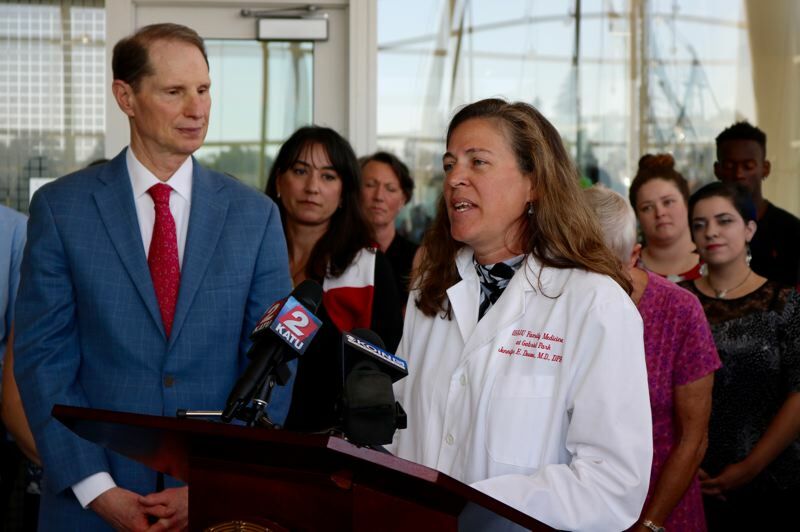 Wyden said the stakes are huge for an estimated 1.6 million Oregonians — 40 percent of the state's population — and 133 million nationally with questions about their health status. "We know we have a big task in front of us to spell out Judge Kavanaugh's record," Wyden said. Flanked by patients and patient advocates, Wyden and Cantwell acknowledged that Senate Democrats face an uphill battle to defeat Kavanaugh, a federal appeals judge who is President Donald Trump's nominee to succeed Justice Anthony Kennedy on the court. But Wyden said he has hope. He and Oregon Sen. Jeff Merkley faced similar circumstances when they set out to defeat Ryan Bounds, a federal prosecutor in Portland who was Trump's nominee for a judgeship on the U.S. 9th Circuit Court of Appeals. "Nobody thought it could be done," Wyden said, "But we spent time trying to get the record out — and we prevailed." Despite their publicizing Bounds' writings as a student at Stanford University, where he mocked multiculturalism and other issues, Bounds appeared headed for Senate confirmation on July 19. The Senate's Republican majority then pulled his nomination when South Carolina Republican Tim Scott, who is black, indicated his opposition. Wyden quoted remarks by Kavanaugh in a 2017 lecture sponsored by the Heritage Foundation, a conservative think tank, that were critical of Chief Justice John Roberts' vote in 2012 to uphold the Affordable Care Act. Roberts usually votes with the conservative bloc but joined the four liberals in that 2012 case, based on the congressional authority to tax. "Kavanaugh made it clear he was sympathetic to striking down the loophole-free, airtight protection of pre-existing conditions in the law," Wyden said. "That is a pretty clear signal, right from the top, that the president chose him because he's not going to do what John Roberts did." As an appeals court judge in 2011 — when the law had not yet taken full effect — Kavanaugh wrote in a dissent that the law's requirement for individuals to obtain coverage or pay a penalty "unprecedented on the federal level in American history." Congressional Republicans stripped that requirement when they passed an overhaul of the federal tax code late last year. In a 2015 decision, Kavanaugh wrote that the constitutional guarantee of freedom of religion was violated by interpreting the law to require religious nonprofit employers, through a third party, to provide birth-control coverage. Trump rolled back that rule last year. "Based on those specific items in the Kavanaugh record, when this case goes all the way to the Supreme Court, the evidence shows Kavanaugh will side with those who want to turn back the clock and discriminate against people with pre-existing conditions," Wyden said. "We think when a lot of Republicans and independents hear about it, they're not going to like it." Cantwell said critics have offered no real alternatives. "The proposals they put on the table thus far as it relates to the insurance market are what I consider 'junk' insurance," which will offer little coverage, she said. "We are not going to have a race to the bottom. Covering people with care is the best way to drive down costs." 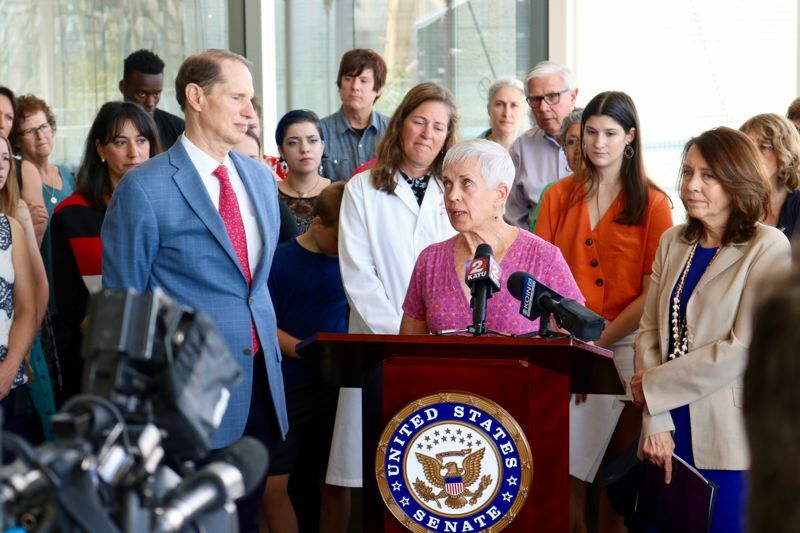 An Oregon Health & Science University doctor and three patients spoke in favor of retaining the federal requirement for coverage regardless of a person's health status. Dr. Jennifer DeVoe, chairwoman of OHSU's Department of Family Medicine, described two patients — one male, one female — who suffered a heart attack and breast cancer prior to the 2010 law and were unable to obtain insurance. The man died in 2010 within weeks after he qualified for Medicare, the federal health insurance program for people 65 and older. "But she lives in fear every day about whether her pre-existing condition will be used as an excuse in the future to deny her access to health insurance coverage," DeVoe said. "It takes more than doctors to treat health problems. It takes policymakers who can help us … so that we all can afford continuous health coverage. The inability to access health care not only puts patients at risk, it puts all of us at risk." The 2010 law enabled Liliana Morrisey, 19, of Portland to stay on her parents' insurance through age 26. Morrisey has Type 1 diabetes, which affects children and young adults. Morrisey, a student at Oregon State University, said she is fortunate she can obtain medications through insurance although they cost money. "As somebody who relies on constant treatment … I worry that in my future, I won't be fighting for access to health care — I will be fighting for my life," she said. "Having access to affordable health care is key to my survival." Pat Janik, 74, of Vancouver, Wash., has osteoarthritis and rheumatoid arthritis — and four surgeries for joint replacements. She said she has healthy habits, and she and her husband put away savings for retirement, rather than depend on her grown children. "Those good responsible habits would not help me at all if I say I have a pre-existing condition," she said. "How can I afford all the surgeries, the images, the tests, the doctors, physical therapy? The list goes on and on. "It is so easy to destroy something. I thank both of you for trying to build something and for trying to keep health care as it should." Afterward, Marian Fenimore, 63, of Portland, said she was able to get insurance — she does not qualify yet for Medicare — to help pay for treatment of torn rotator cuffs, chronic gastritis and neuropathy, and diagnosis of blood abnormalities. "I was able to get insurance to begin with and they did not care that I had pre-existing conditions. That's what the Affordable Care Act has done for me," she said. "Without it, I'd be stuck without insurance … and I'd have to pay out of pocket. "It really concerns me because there are so many aspects to the law that have made a difference to a lot of people."